As part of a 10-month investigation, the Covington Police Department executed multiple warrants at A&E Fashions and Beauty Supplies, a downtown Covington store located at 812 Madison Avenue. The long investigation was centered around allegations the store was purchasing EBT cards for 50% or less of their value with cash. Police believe those people selling the cards were using the cash to buy heroin. 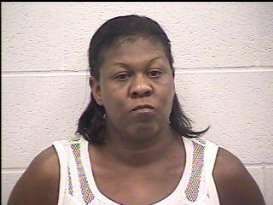 Warrants were issued for several individuals at the store, including A&E employee Phyllis Tyler. Police Chief Spike Jones told The River City News that this is just another avenue for combating the heroin problem in Covington. Tyler was booked into the Kenton County Detention Center Friday before posting bond and being released. She is charged with making a false statement and misrepresenting herself to receive benefits. Tyler is scheduled to appear in court on Monday morning. This story will be updated with more information on the investigation, warrants issued, and the names of other individuals involved soon. For more details on this investigation and other breaking news around NKY, visit RCN on Facebook and Twitter. CORRECTION: Phyllis Tyler was previously identified as the owner of the store. She contacted RCN to let us know that she is not the owner, but an employee. RCN regrets the error and apologizes to Ms. Tyler.